As of late, I’ve been having a love affair with avocados. Curvaceous, soft, subtle—I love this green being. There is something satisfying about scoring the inside and gently manipulating the peel to easily pop out perfect dice size pieces. And taking the bumpy peel off is quite exciting as well. Whew, stop me now! I’ve been trying to find ingenious ways to sneak this green goddess into my meals. Its soft mouth feel, fitting for a teething baby, offsets harder foods, and the cooling affect is a welcome reprieve against hot, spicy sauces; I’m kind of a baby when it comes to anything about a “medium” level. Naturally, tacos seemed to be the way to go. Last week I made some delectable pork tacos, but this week I was craving some fish. Please, tell me what could have been a better way to merge my love of seafood and the overabundance of corn tortillas I had lurking above the microwave. I love tacos because you can use your creativity by going after the long, laborious recipes featuring different sauces and slaws and spices. Or you can be lazy: sprinkle some taco seasoning on your meat, and while that cooks on the stove top (or in the oven, which is even less labor involved) slice up a few vegetables and warm up your tortillas. Crack open a cold drink and enjoy the texture party thumping away in your mouth. 1 Preheat oven to 325 F. While the oven heats up, put fish (haddock, tilapia, or whatever floats your net) in a tinfoil lined oven safe dish. Coat with cooking spray or olive oil. 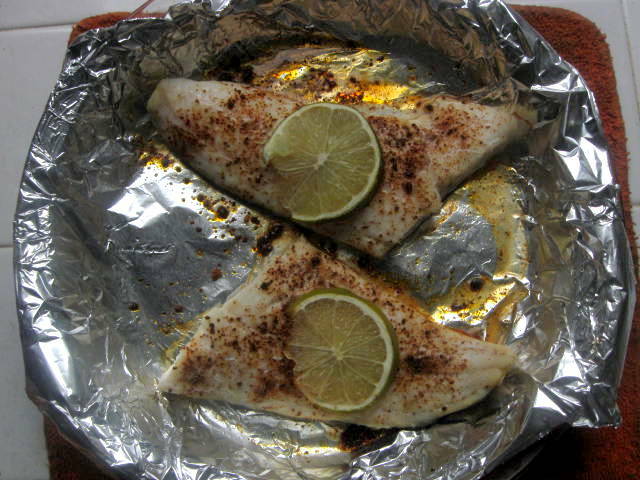 Sprinkle fish with taco seasoning and place one slice of lime over each filet. Cook for 20-25 minutes. 2 While the fish cooks, prepare your innards. 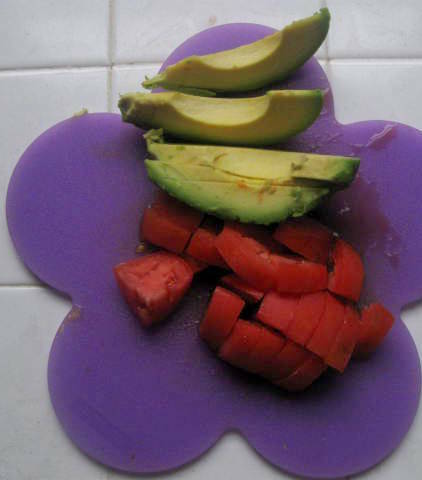 In this case, slice up ½ an avocado and ½ a Roma tomato. Put Aside. Wrap up the other half of the avocado and tomato for later on. To best preserve the avocado, save the side with the pit for later use. Rub a little bit of lemon juice on the exposed flesh. This will cut down on oxidation, which is what turns the avocado that icky brown. Use within 24 hours. 3 Open can of refried beans and microwave according to instructions on the label. 4 Heat up skillet to a notch over medium. 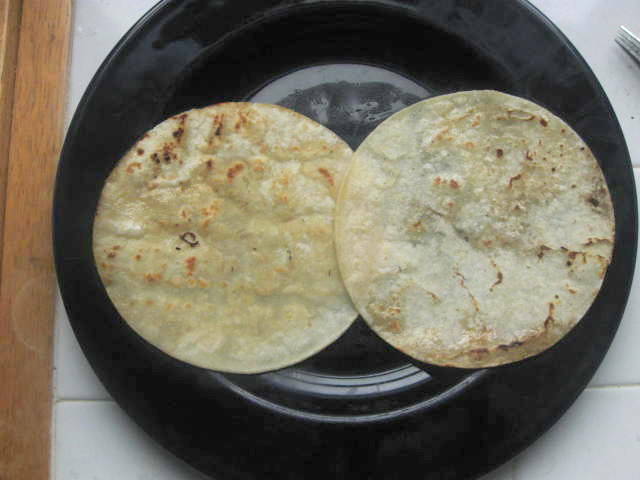 Melt small amount of oil or butter (regular or Earth Balance) in the bottom and place the tortilla on top. When the tortilla starts bubbling, flip over with fork. If not crispy enough, flip back over and give it a few more moments. When both sides have been warmed, place on plate. Repeat with a second tortilla. 5 Gently scoop some of the refried beans onto the tortilla and spread, with the backside of a spoon, as evenly as possible. 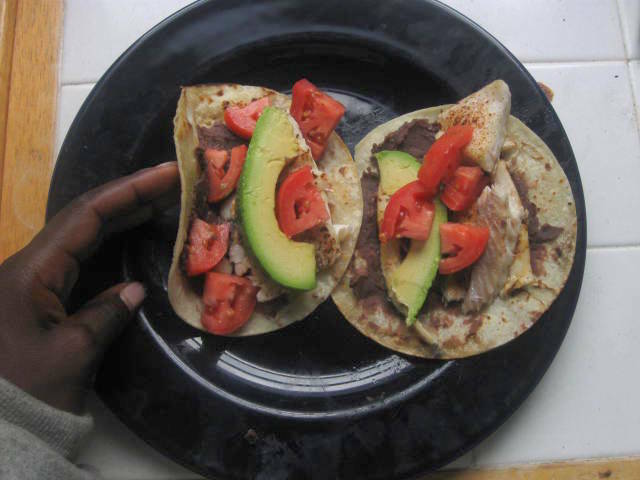 Take care if using corn tortillas, as these are thinner than flour tortillas. 6 When the fish is done cooking, remove from oven and let cool for 3 minutes. While cooling, start to assemble the tortillas. Place all items onto one side to make folding easier. Add on your tomatoes and avocados. When fish is cool, add to the pile. 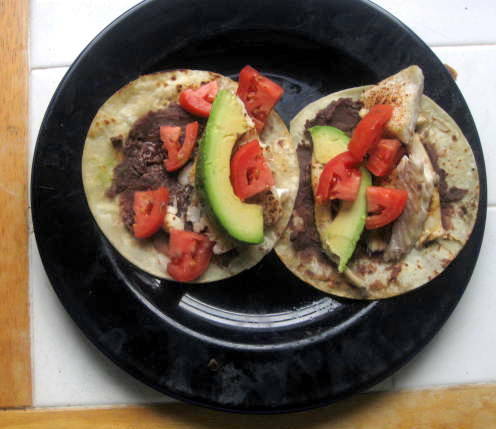 Fiscal Flash: for this meal I bought ½ a pound of haddock and spread it out over 4 tacos (2 per meal.) Haddock is a flakier fish, but I left the skin on, which kept everything together. The ½ pound of haddock only cost me $3.37. The avocado was $1 and one Roma tomorrow is probably equal to 30 cents. I believe one lime is 40 cents as well. 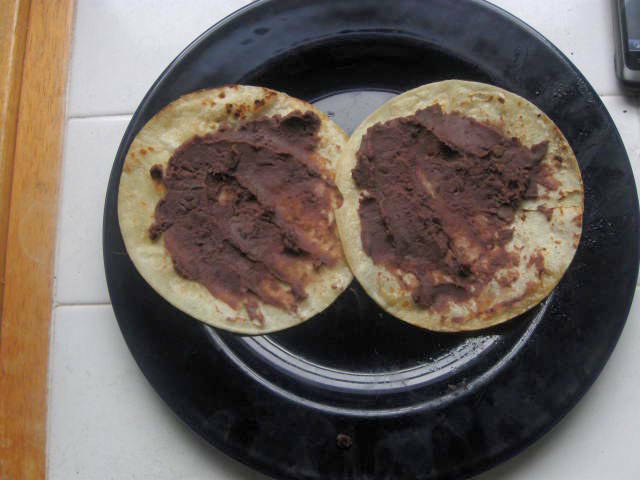 The tortillas I already had, along with the refried beans (a can of the Full Circle Organic line is $1.39/ can, and I only used a minuscule amount.) Rounding the total cost up to $5.07, I ended up paying $1.275 per serving. That’s taco bell prices, but the quality is obviously better.